A patient’s informed consent can be surprisingly uninformed when it comes to a common cancer biopsy, a study led by a University of Florida Health researcher has shown. That finding may have important implications for what researchers view as a seeming epidemic of thyroid cancers that scientists believe isn’t everything it seems. A survey of patients undergoing a thyroid biopsy found a high proportion remained unaware of crucial information about the procedure, including their risk of thyroid cancer or that the test might be inconclusive, even after signing an informed consent document. Informed consent is a patient’s acknowledgment that a doctor has fully explained a procedure or surgery and that the patient understands its risks and benefits. The study raises the possibility that “informed consent procedures that meet legal standards may nonetheless leave patients undergoing a thyroid biopsy paradoxically uninformed,” said the study, published in the journal Endocrine. A signed consent should come only after a thorough discussion between patient and clinician, said lead author Naykky Singh Ospina, M.D., an assistant professor in the UF College of Medicine’s division of endocrinology, diabetes and metabolism. But the study suggests something may be broken in that transfer of information. “These findings are important because this means people are consenting to and having a thyroid biopsy without knowing very basic things about it,” Singh Ospina said. Her study surveyed 196 patients at the Mayo Clinic in Rochester, Minnesota, after they underwent a biopsy of a thyroid nodule. Participants were well-educated, mostly women and had a mean age of 58 years. More than half of the patients did not know their estimated cancer risk before the procedure. Only a third were aware that they might require further testing after a biopsy when, for example, it is inconclusive. A large proportion of patients also misunderstood the downstream implications of a biopsy, from the likelihood of surgery to follow-up monitoring of benign thyroid nodules. With the detection of thyroid nodules and thyroid cancers skyrocketing in the U.S. and around the world, it is critical that patients have a comprehensive conversation with their physician to determine whether a thyroid biopsy would be beneficial, Singh Ospina said. Thyroid cancer diagnoses in the U.S. have quadrupled in the last 40 years, though the mortality rate has remained about the same. The number of thyroid biopsies doubled between 2006 and 2011, according to a study cited in Singh Ospina’s paper. About 64,000 people in the U.S. were diagnosed with thyroid cancer in 2016, the American Thyroid Association says. Fewer than 2,000 people in the U.S. die annually of the disease, which is typically slow-growing and nonaggressive. 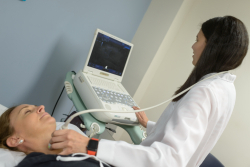 The reason is that thyroid nodules are being found incidentally, including during routine physicals of patients, as ever more people are screened by CAT scans and ultrasounds, which have become far more common in medical settings. The result is often the discovery of small thyroid nodules in asymptomatic people who might otherwise have lived their lives without knowing or being bothered by them. Singh Ospina said many researchers argue this has led to an increased number of surgeries and other interventions for thyroid cancer even as mortality from the disease remains flat. Some thyroid nodules, especially smaller nodules with a low risk for thyroid cancer, can be monitored by ultrasound without the need for biopsy, she said. Singh Ospina is working on several follow-up studies to be conducted at UF Health. One involves recording the encounter between patient and physician before a biopsy to glean information that could help ensure patients are properly informed about their options. The study also would develop a conversation aid to help support the conversation between patients and clinicians. Co-authors of the study include researchers at the Mayo Clinic, the University of Arkansas for Medical Sciences, Aventura Hospital and Medical Center in Miami, and the Central Arkansas Veterans Healthcare System.